What Types of Whale Are At The Great Barrier Reef? From June to September, around 10,000 whales migrate from Antarctica to the Great Barrier Reef to breed and calve. Humpback and dwarf minke whales are commonly seen and there are plenty of other species to lookout for as well; including orcas, false killer whales, short-finned pilot whales, sperm whales and beaked whales. Can I Swim With Whales At The Great Barrier Reef? Yes! 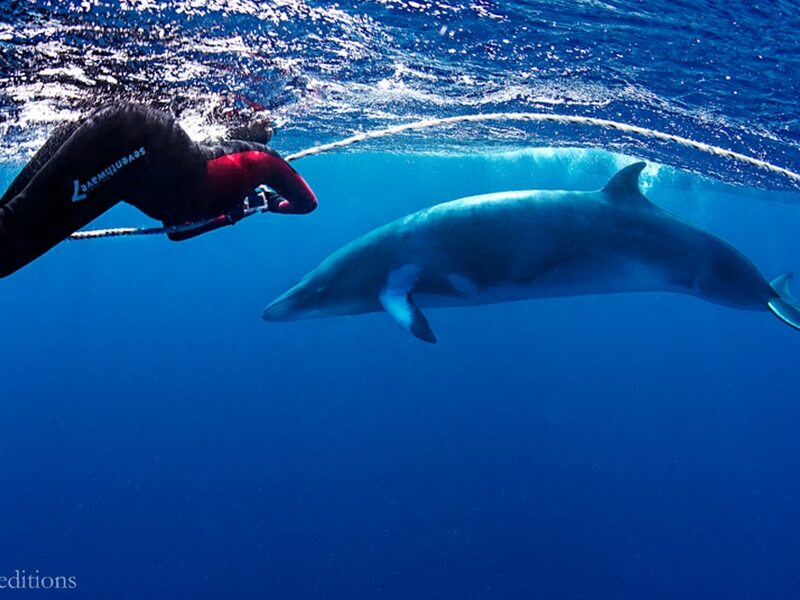 You can swim with dwarf minke whales at the Great Barrier Reef. These whales are only found in the southern hemisphere and migrate to the Coral Sea each winter to breed and calve. Their migration route was discovered in the 1980s and the Great Barrier Reef is the only place in the world where divers and snorkelers can jump in the water with these curious whales. They can grow up to 8 metres in length, weigh up to 6 tonnes, and live for up to 60 years. Each whale has a distinctive colour pattern, making it easy to identify individual whales in the water, and they are known to approach divers closely when encountered. Humpback whales are more timid than dwarf minke whales. These whales can reach lengths of 15 meters and weigh over 40 tonnes. Divers can enjoy listening to their song underwater and watching the whales breach and tail slap at the surface. Who Offers Whale Swimming Safaris at the Great Barrier Reef? The M/V Spoilsport liveaboard offers minke whale safaris during June and July each year. 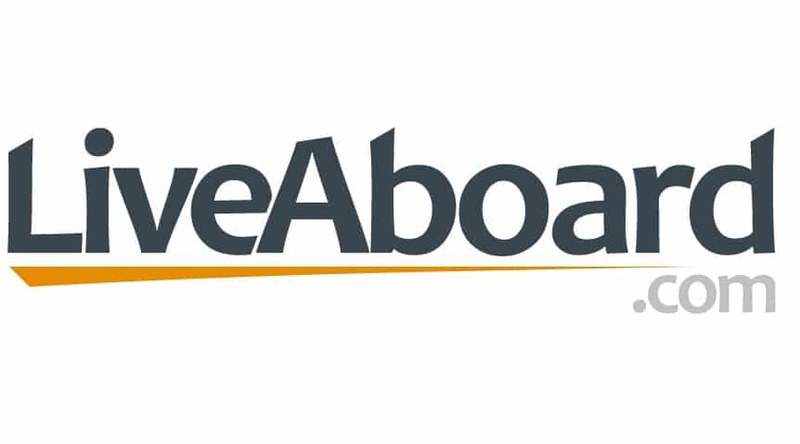 This liveaboard also hosts special Minke Whale Coral Sea expeditions with Mike Ball Dive Expeditions. Guests on these safaris can participate in minke whale behavioural monitoring and research, enjoy lectures about the reefs and whales, and spend plenty of time swimming with the whales. These minke whale expeditions have had a 98% success rate of finding the whales since they began in 1996, and the largest pod they have seen consisted of 28 whales. Their longest encounter with the whales lasted a whopping 10 hours! 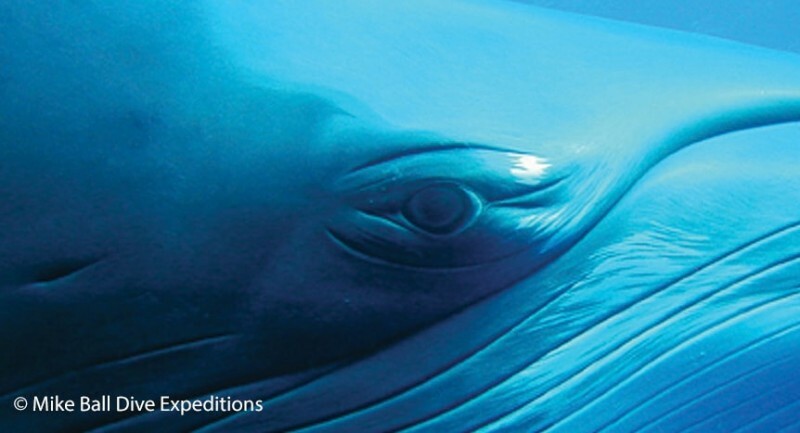 The OceanQuest liveaboard also offers Meet the Minke whale safaris during June and July each year. What Else Can I See At The Great Barrier Reef? One of the advantages of visiting the Great Barrier Reef in whale season, is it also happens to be peak diving season with dry weather and great sea conditions. Divers can experience some of the 1500 species of fish, 400 coral species, and numerous sharks found at the reef. 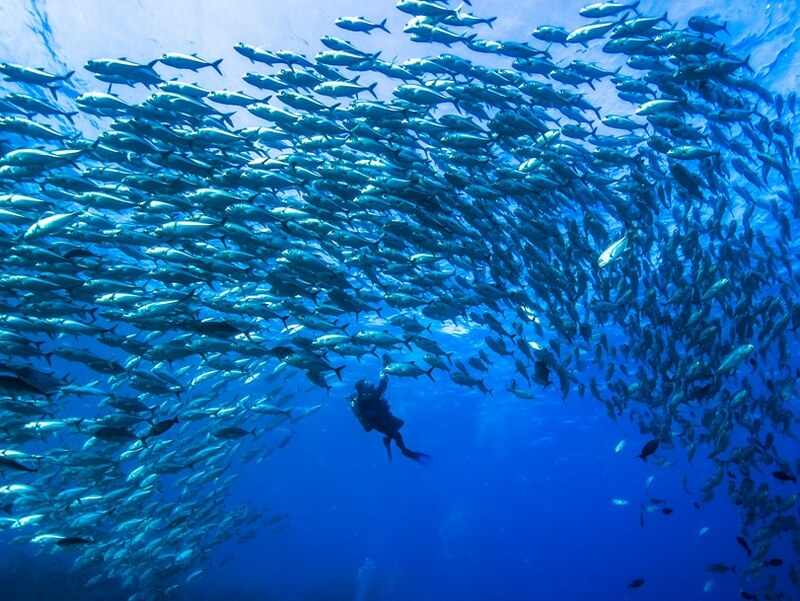 There are many scuba diving highlights, such as exploring Ribbons Reef, a chain of remote reefs in the northern part of the Great Barrier Reef, to swim with huge diver-sized potato cod at Cod Hole. The beautiful Lizard Island national park is also well worth visiting to enjoy pinnacles, walls, flat reefs and pelagic diving. 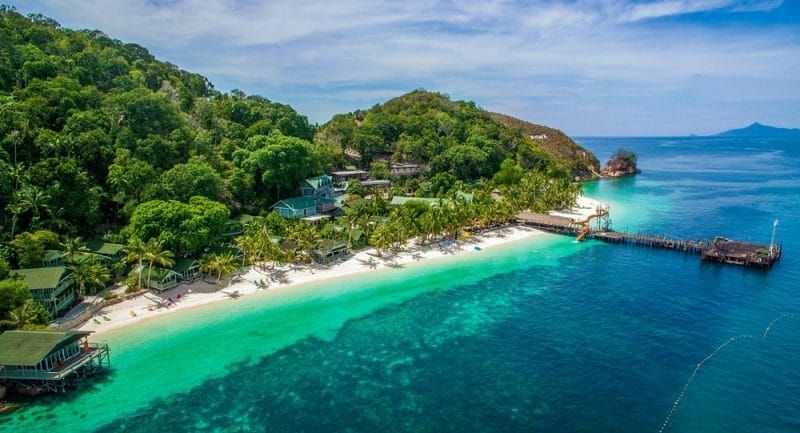 Osprey Reef is known for large animal encounters and is the place to go in search of whale sharks, beaked whales, sperm whales, bottlenose dolphins, eagle rays, mantas, green turtles and loggerhead turtles. 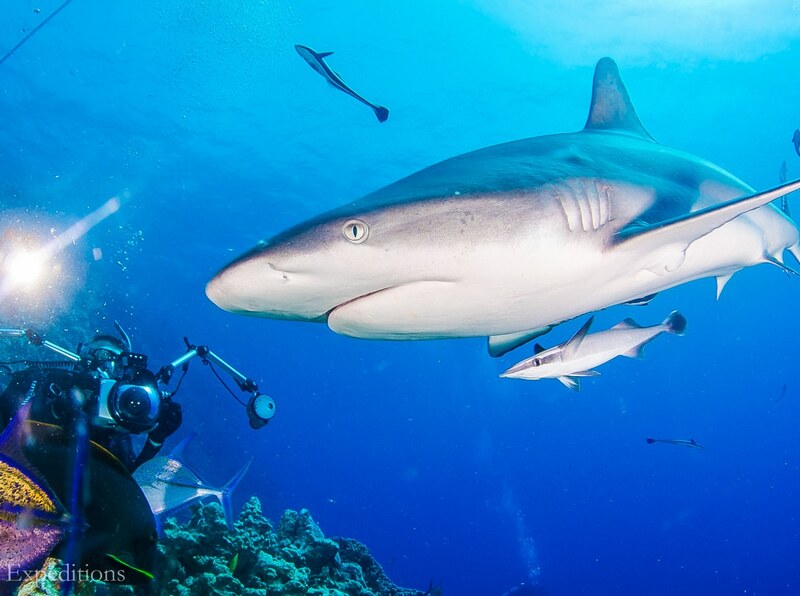 North Horn at Osprey Reef is famous for its shark feeding dives with silky and grey reef sharks. Flynn Reef has some of Australia’s best corals, whilst Milln Reef is ideal for snorkelers and new divers. Bougainville Reef is an exposed reef that can only be reached when conditions permit and offers some of the most unspoilt diving in the area. The SS Yongala wreck is unmissable for wreck fans and is one of the best wreck dives in the world. The wreck sank in 1911, is relatively intact and hosts a huge variety of marine life. What Experience Level is Needed For Diving At The Great Barrier Reef? Diving at the Great Barrier Reef is suitable for all dive experience levels and there is plenty for new and experienced divers to enjoy. Swimming with dwarf minke whales is conducted at the surface using a snorkel, though it is recommended to be a qualified diver to also take advantage of the dive sites on offer during the safari. Previous Previous post: Explore and enjoy – at DIVE 2018!